Have you seen the movie Wall-E? The passengers on the cruiser are so used to a stationary lifestyle their bodies evolved into, well, blobs. The current obesity rate for adults in the U.S. is approximately 35.7% and if it progresses at the current rate, 41% of Americans will be obese by 2030. 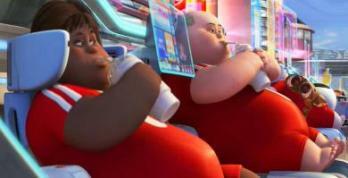 (Source: CDC) It’s time to make a change by living a more active lifestyle so we don’t end up like the passengers in Wall-E. When individuals live a more sedentary life style they, more often than not, have a high BMI which leads to obesity. 3,500 calories make up one pound so increasing physical activity is a good way to maintain a healthy weight and prevent obesity. Here are a few known and unknown ways to increase your physical activity and burn some extra calories. Work out: A general aerobic exercise can burn a little over 200 calories in 30 minutes. Walk more: Health and fitness experts advocate taking 10,000 steps a day. Depending on your speed you can burn an extra 175-350 calories a day. Make it a contest with your friends, families, or coworkers. How do I keep track of all these steps you ask? Pedometers are available online or at your local store. Drink Coffee: According to Susan B. Roberts, professor of nutrition and psychiatry at Tufts University in Boston, caffeine increases the rate at which you burn calories. Sleep more: Getting fewer than four hours of sleep over an extended period of time slows down the metabolism. The goal should be between 7 and 9 hours. Do things by hand: We like having tasks done for us but doing those tasks yourself increases the time your body is moving ergo burning calories. Laugh: You can burn up to 50 calories just by laughing 10 to 15 minutes a day. Fidget: You can burn up to 350 more calories a day than someone who remains stationary, according to a study at the Mayo Clinic. These tips plus eating healthy are great steps in the right direction to preventing obesity. If you or someone you knows health is being affected by obesity please contact FirstHealth at (800) 213-3284 to get more information about weight loss solutions. To learn more about weight-loss surgery options attend one of our free bi-monthly bariatric surgery seminars on the first Thursday and the third Monday of every month. Register for this free weight-loss surgery seminar today! Our comprehensive Bariatric Surgical Program serves patients in the Pinehurst, Sanford, Raeford, Laurinburg, Lumberton, Troy and Rockingham regions of North Carolina and beyond. Call (800) 213-3284 with questions or for more information.